There’s no better time than summer to refresh our memories about the sun and how it can damage skin. Many of us will be spending the next few months outside, running, jumping and playing in it. While you are out there enjoying the beauty of Mother Nature, follow these tips for protection and prevention of skin cancer. Shade: Get under it as much as you can. Pay special attention to the peak hours, usually 10 am to 4 pm. Sunscreen: Use it every day. Apply a broad spectrum sunscreen to any skin that will be exposed to the sun during the day. Be sure not to miss your tender feet, ears and scalp. 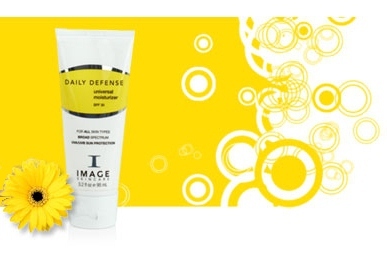 Look for a product with natural ingredients such as Image Skincare’s Daily Defense line. Cover: Use clothing to cover exposed skin. Don’t forget sunglasses and a hat to protect your eyes, scalp and neck. : Skip it. Tanning outside or in a tanning booth should be avoided. Just a few tanning sessions a year increases the risk of melanoma dramatically. Burning: Avoid it by using the prevention hints above. According to the Skin Cancer Foundation, “A person’s risk for melanoma doubles if he or she has had five or more sunburns at any point in life.” Ouch! Snow or Surf: Use caution. The reflection from snow and surf increases the intensity of UV rays so use a higher SPF sunscreen, re-applying every two hours, after swimming or sweating is important. Infants: Keep them out of the sun. Their tender skin can be damaged very quickly. Protect them by limiting any sun exposure. Little ones should not have sunscreen before 6 months of age. Mother Nature is glad to have you experience her wild outdoors. She just hopes (as do we) that you’ll do so wisely so you can enjoy it for many years to come. Extremely important reminders! While enjoying our vacation during the summer we forget how we harm our skin by over exposing it to sun. Applying sunscreen and using shades and hats are simple things that can protect our skin. We have a misconception that staying outside during the summers harms the skin. But in reality staying outside during the winter months for skiing or other activities harm the skin more. The reflection of the sunrays from the snow damages the skin greatly.